My hubby & I LOVE mushrooms - we always buy a big container of them on our twice monthly trips to Costco. 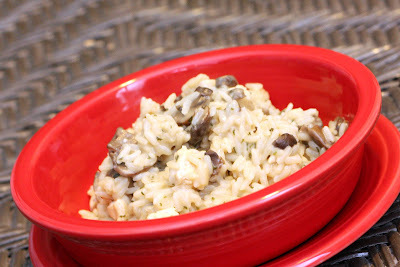 For some reason, we didn't finish the container this time, so we decided to make some risotto. While it's not a fast meal to make, it's actually pretty easy. And soooo tasty! We didn't have any onion, but it was still good. This recipe is definitely a keeper. Cut chicken breasts into small pieces. Saute lightly in 1T olive oil (do not fully cook - they will finish cooking later). Set chicken aside & drain pain. Add 2T olive oil to same pan and saute onion on medium-high heat until translucent. Add garlic, then rice and saute for a couple minutes until rice is coated with oil. Add mushrooms and saute briefly. Ladle hot stock over rice 1 cup at a time to just cover mixture. Stir regularly to avoid sticking to bottom of pan and to create gravy. As the liquid cooks off so that it is almost gone, add more stock, again to just cover the mixture. Repeat this step until appropriate texture of rice. It’s done when the rice is slightly firm to the bite. Once the rice is mostly cooked, add the chicken back to the pan. 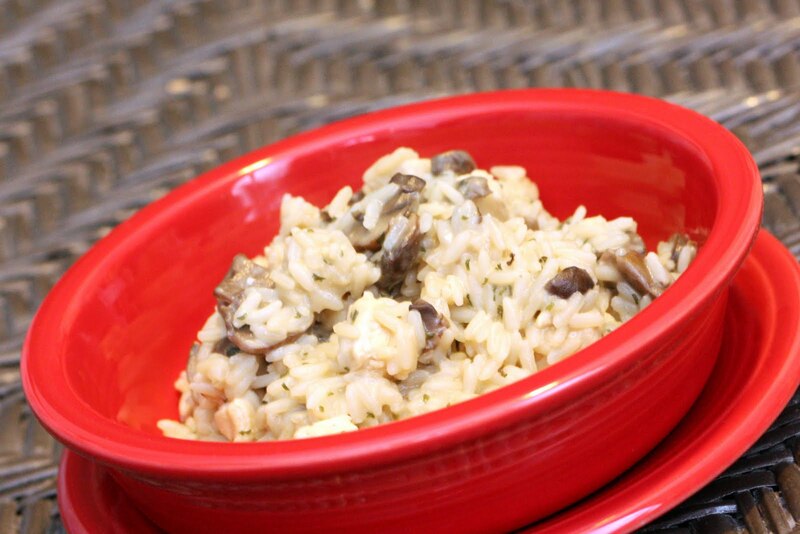 Once the rice is al dente, you may need to add extra stock to form a loose gravy. Once a somewhat loose consistency is achieved, turn off heat and toss in the parsley and the butter. Stir until butter is incorporated. Add Parmesan and stir in once again. Garnish with extra Parmesan and parsley. Serve immediately. Note: This reheats wonderfully! I love it when I have some left over to bring to work for lunch!